BHS manufactures standard and custom warehouse equipment for a variety of material handling needs. We focus on ergonomics and durability, and every product offers years of dependable service while improving workflow. Click on any of the products listed below for more information or call our sales team at +1 314 423 2075 to find a dealer near you. Avoid risky bending and lifting, move materials to an ideal height. Perform work in the perfect position. Mobile and stationary storage lockers, work stations, and shelves. Customizable carts for ergonomic transportation. Carts and desks designed to streamline order fulfillment. Safe, heavy-duty storage and transport equipment for gas cylinders. Safe transport and storage of cable, wire, spools, reels, and conduit. Easily lift and empty bins and barrels weighing up to 1,653 pounds. High capacity ramps make loading and unloading safe and easy. Bollards and barrier rails keep people and products safe. Customizable steel and glass products for a variety of applications. Dependable warehouse equipment streamlines any material handling task for optimal safety, efficiency, and productivity. BHS offers an extensive line of heavy-duty products for industry, including specialized storage and lifting devices that provide crucial ergonomic benefits for staff. BHS warehouse equipment helps to increase productivity in your operation by matching materials with specialized handling devices. For instance, facilities that regularly employ wire, cable, or rope will benefit from the BHS Parallel Reel Payout, a durable series of reels that provides long-term storage and effortless payout for spooled components. Workplace safety is a top concern for every employer. 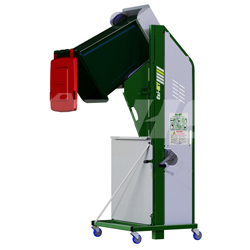 BHS equipment prioritizes user well-being, helping to protect workers and comply with federal safety requirements. The OSH Act’s General Duty clause requires employers to keep work sites free from hazards that “are likely to cause death or serious harm to employees.” BHS warehouse equipment helps to eliminate these hazards with powerful steel barrier rails that prevent falls, protect infrastructure, and separate forklift traffic lanes from pedestrian areas. Improve your operation’s ergonomics program with equipment that is designed for workers. BHS Lift Tables are highly customizable, helping to prevent musculoskeletal disorders in a variety of applications. Scissor Lift Tables also make great variable-height workstations that allow staff to keep work at customized heights. BHS Lift Tables, Bin Tippers, and Forklift Attachments also prevent manual lifting, helping to decrease rates of musculoskeletal disorders associated with picking up heavy loads. 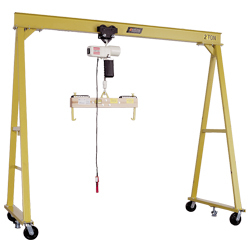 Mechanical lifting devices increase productivity, and they are recommended by OSHA and NIOSH guidelines. Depending on where your facility is located, providing adequate equipment for your warehouse may even be required by law. BHS lifting devices provide compliance with various directives while protecting workers. Hazardous materials and awkwardly shaped loads can present challenges for warehouse managers. BHS offers a series of specialty storage devices to fit any operation. 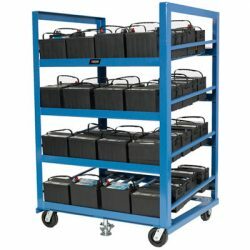 The BHS Automotive Battery Rack holds up to 96 batteries, protecting stock with welded steel shelves. Acid-resistant powder coating protects infrastructure even when batteries leak. For stationary storage, BHS can custom-build industrial shelving systems to meet your specifications, providing heavy duty surfaces for all types of products. Full powder coating resists acid and scratches for safe, reliable storage in any industry. BHS provides the resources you need to run a safer, more efficient warehouse. For one example on how to use BHS Structural Barrier Rails, read our Tech Tip about safety enhancements. To find more information on the warehouse equipment listed above, you can access our product literature here or call us at +1 314 423 2075 to find a dealer near you.